Clear Channel Ireland has won the contract to install 70 digital screens in Tesco stores nationwide, it has been announced. 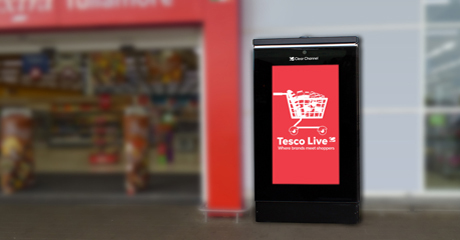 Following a competitive tendering process, Clear Channel is to launch the ‘Tesco Live’ network of screens and will be responsible for maintaining and selling the associated advertising space at selected Tesco stores. The screens will be located in premium positions at the entrance to Tesco Stores and are being provided by Amscreen, Europe’s leading digital signage solutions company. The portfolio will be powered by Play IQ, Clear Channel’s intelligent scheduling and content management system which enables seamless ad-serving across all sites. Clear Channel are now Ireland’s leading Digital Out of Home Media Owner bringing to 280 the number of digital screens across Ireland. In another media-first, Clear Channel Northern Ireland were the first to install digital screens at Bus Shelters.